The continuous flow of information or events can be classified into one of these brackets (or even both) for analysis or correlation. 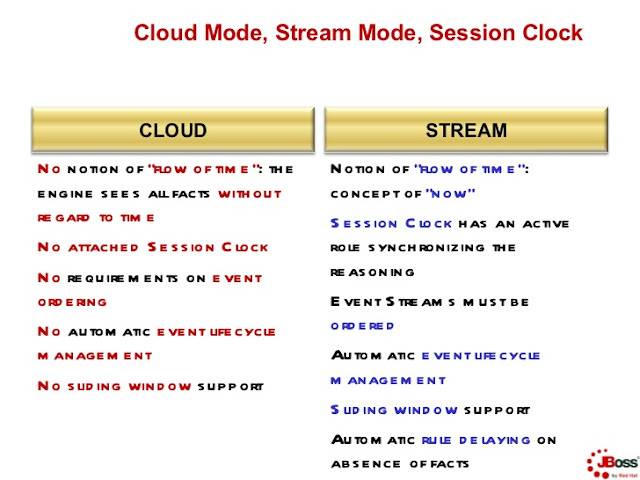 The cloud mode would be useful in the following circumstances: user behavior, market data and activity monitoring. 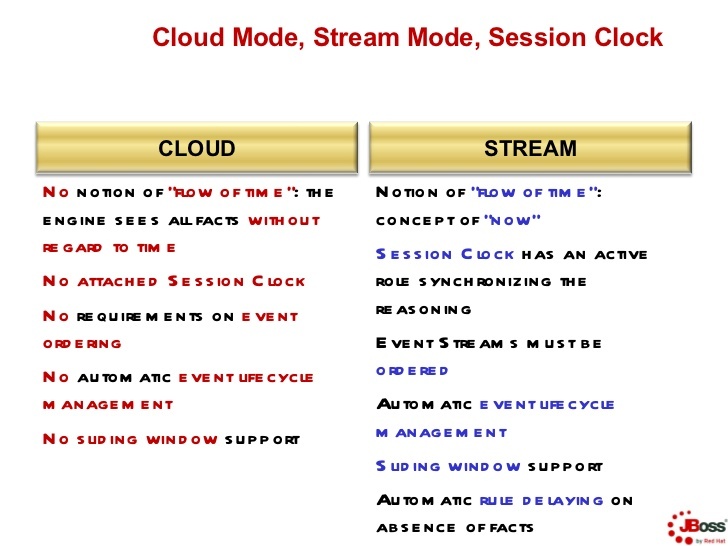 The stream mode could be most useful in applications such as: real-time event monitoring, event correlation, and sensor networks. The most useful end-applications are Threat Detection, Anomaly Detection, Airport Security, Market Prediction, Forecasting Profits, Automating Algorithmic Trading Decision among a host of other applications. The Batch Window illustration as given below, demonstrates that the information window is processed in discrete or fixed slot or block of events. The Sliding Window illustration as given below, demonstrates that the information window is processed in continuous or moving slot or block of events. Introducing Sherlock! (Mystery That is Data), which is an event correlation application that demonstrates the above concept of Complex Event Processing. It is built for the domain of banking for anomaly and threat detection. It will analyze the following use-cases that have been listed at the 'Top Threats, Especially in Banking Sector By SANS Instittute'. SANS Institute is a Co-operative Research and Training Institute for Information Security. 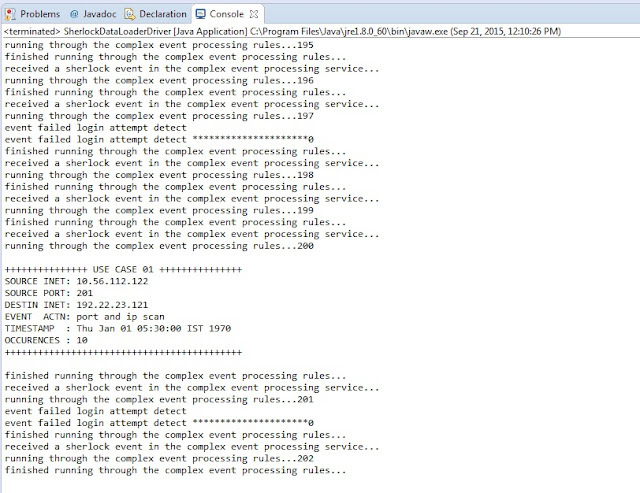 rule "Port and IP Scan Event Processing Initial"
rule "Port and IP Scan Event Processing Correlation"
The above file named 'kmodule.xml' is include in the META-INF of your project. Make sure you make it available in the classpath of your main class. 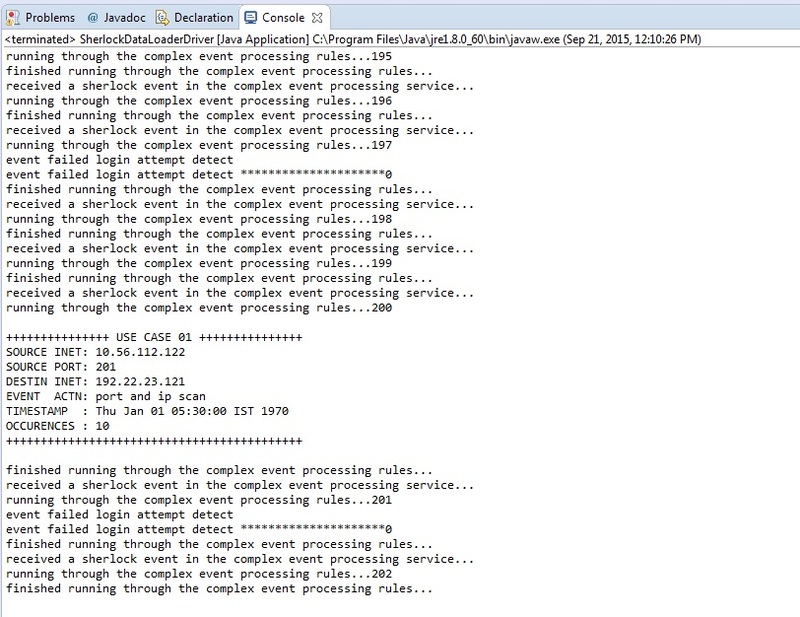 The SherlockComplexEventProcessing includes the Java Code for Drools Fusion Runtime. The following are the most important activites perfromed by this runtime. * essential part of feeding data to the Knowledge Is Everything API of Drools. * provides the core of the Sherlock Intellect. Now run the SherlockDataLoaderDriver which in turn starts the SherlockDataLoaderThread to intelligently load random data and 'Inject Positive Cases' into the large stream of information. We have controlled the above data load to create only 100 random records and then wait for 10 seconds. You can change this for your demo or poc purposes to suite a larger data stream and lesser or greater wait time. You may include Sherlock! code for demo, hack or for proof-of-concept of Drools Expert or Drools Fusion or simply Complex Event Processing. Download entire Sherlock! Code, Data Loader and Basic User Interface as an Eclipse Project. wish all the best to the curious minds of every part of the world, who want to get deep into the world of data science, complex event processing or rules engines. wait for the comments.